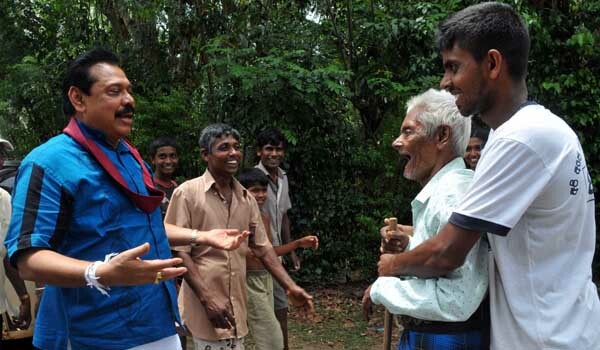 President Mahinda Rajapaksa is seen here having casual chats at many informal stops in towns of Kirama, Katuwana, Walasmulla, Modarawana, Beliatte, Galagama and Ranna in the Hambantota district Southern Province of Sri Lanka. 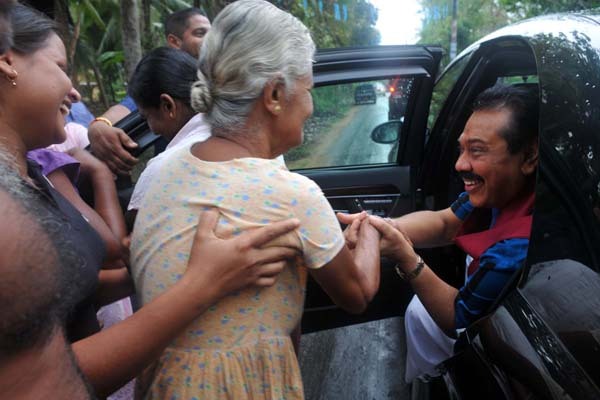 He visited those towns, some are still rural villages after casting his vote at D.A.Rajapaksa Maha Vidyalaya poling station in Medamulana, his home town yesterday afternoon on 8th April 2010. President Rajapaksa talked to his countrymen, most of them are his party supporters and requested that they cast their vote to give him a clear mandate and a solid majority in parliament which is absolutely crucial for rapid development of the country through unwavering stability after eliminating terrorism. At Ranna town he talked to a fire cracker seller and also purchased a lottery ticket. People of those towns were surprised and overwhelmed to see the head of the state talking to them just like an ordinary person. Mahinda is a true Patriot and not a phony like Ranil. The last time he visited New York he met with the expatriate community. When the organizers of the event wanted to have people line up to greet him he said he would mingle with the crowd and talk to them informally. He made eveyone feel that they could trust him. He was very friendly and polite to everybody. The time that Ranil visited New York, he turned up late for the event and rushed through it like a duty he was not happy to perform. We had to line up to shake hands with him like he was a big dignitary doing us a favor by shaking our hand. It was very impersonal. He would not look you in the eye. He was shaking my hand and talking to somebody else at the same time like I was not important enough to pay full attention to. I felt very insulted and swore that I would never support him for a head of state. He rushed off with a Royal College buddy for dinner as soon as he finished shaking hands leaving the guests to have the dinner provide on their own. 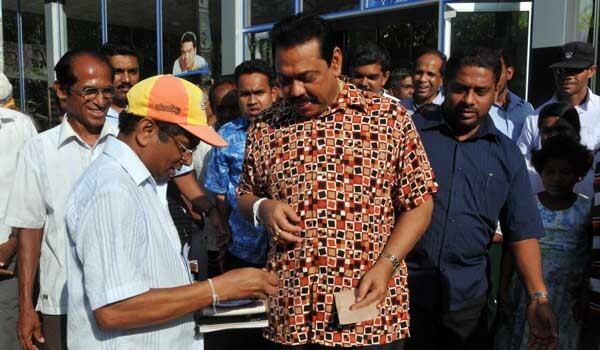 On the other hand Mahinda was very friendly and acted like everyone was important. He went round speaking to everybody at the gathering. He stayed and had dinner with everybody else like a part of the group. He won many friends that day. These two politicians are very different. Mahinda is a great success today and Ranil is a total failure. He is not suited for politics and should get out of it. 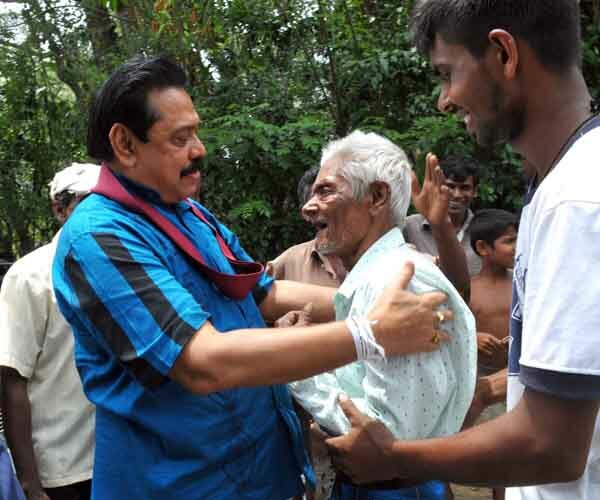 Mahinda is still the same person who like to be a part of the society! President Mahinda is truly a people’s President. We are proud of him. H.E President Mahinda Rajapaksha is a true srilankan. Looking at this pictures we can see how much he is attached to to srilankans.